The compressive strength of the concrete cylinder is one of the most common performance measures performed by the engineers in the structural design. Here, the compressive strength of concrete cylinders is determined by applying continuous load over the cylinder until failure occurs. The test is conducted on a compression-testing machine. The cylinder specimens are cast in steel, cast iron or any mold made of non-absorbent material. Even under severe conditions, the moulds used must retain its original shape and dimensions. The mold must hold the concrete without any leakage. 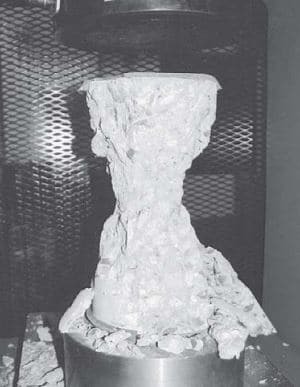 Before placing the concrete mix within the mold, the interior of the mold must be properly greased to facilitate easy removal of the hardened cylinder. The mixed concrete is placed into the molds in layers not less than 5cm deep. The strokes per layer during the compaction must not be less than 30 in number. Compaction must reach the underlying layers allowing the majority of the air voids to escape. The specimens are stored undisturbed in a place with at least 90% relative humidity at a temperature of 27° ± 2°C for 24 hours. After this period, the samples are taken and submerged in clean and fresh water until the testing age is reached. The concrete cylinder is cast for standard size and allowed to cure for 28 days. Three specimens of the same dimension are cast for testing. Takeout the specimen from the curing tank. Wipe out the excess water from the surface of the specimen. Place the specimen vertically on the platform of compression testing machine. Uniform load application and distribution is facilitated by having pad caps at the ends of the cylinders. Before starting to apply the load, make it sure that the loading platforms touch the top of the cylinder. Apply the load continuously and uniformly without shock at the rate of 315 kN/min. And continue the loading until the specimen fails. Record the maximum load taken. The test is repeated for the remaining two specimens. Test at least 3 specimens. The diameter of the casted cylinder must be measured in 2 locations perpendicular to each other at its mid-height. The average of these values is taken to calculate the cross-sectional area. If the diameter measured differs more than 2%, the cylinder must not be tested. The technician in charge of the test conducted must record the following observations before and after the compression test of the cylinder. The strength of concrete increases with age. Table-1 shows the strength of concrete at different ages in comparison with the strength at 28 days after casting. Prior to the compression test, the cylinder must not be allowed to dry out completely. Gloves and protective goggles have to be worn to protect from harm from the specimen breakage.